Great job, thanks for the work! This is going to make my life a little easier to say the least. Any chance of it being modded again to add a few more features? I find this EnScript very useful too. However, I have a few comments after using it on some hits recently. It seems that if the hits appear in a html file, the tags within the file will mess up the layout of the HTML report. Is it possible to have a separate EnScript to create the HTML page from the dmp files separately so that I can do some post-processing on the dmp files, e.g. remove all the HTML tags before creating the HTML summary? Or is there an easier way out? Mike Ciaramitaro here, thanks Lance!! I spent 2 hours trying to figure out how to deliver the contents of my search results to a client and when I was ready to do it by hand, I found your EnScript. Now I can leave my house this weekend! Thanks. Great to hear from you! Send me an email at lance (at) forensickb.com to catch up. As we discussed in Almere, please put in the ability to export the data also into a csv-file. Does this script work with 6.14.0.159? I am running it on this version with a 160 hits selected and it produces an HTML report with headings and nothing else. Been searching for a way to do this and your EnScript saved the day. Thanks!!!! I do have one question though. 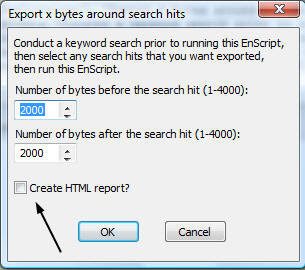 I used your EnScript to create an HTML report with 4,337 search hits. At various locations in the HTML report, the formatting (columns and such) get all caddywhompus and turn into actual HTML where the parsed bytes are being displayed as if it were being viewed in a web browser. Did that make sense? As stated in a comment a few above, is there a version yet that exports in a csv format so I can sort the data and create a nice spreadsheet listing?